The species name camelopardalis (camelopard) is derived from its early Roman name, where it was described as having characteristics of both a camel and a leopard. The English word camelopard first appeared in the 14th century, and survived in common usage well into the 19th century. A number of European languages retain it. The Arabic word الزرافة ziraafa or zurapha, meaning "assemblage" (of animals), or just "tall", was used in English from the sixteenth century on, often in the Italianate form giraffa. Male giraffes are around 16–18 feet tall at the horn tips, and weigh 1700–4200 lb. Females are one to two feet shorter and weigh several hundred pounds less than males. Both sexes have horns, although the horns of a female are smaller. The prominent horns are formed from ossified cartilage and are called ossicones. Males sometimes develop calcium deposits which form bumps on their skull as they age, which can give the appearance of up to three further horns. Giraffes have spots covering their entire bodies, except their underbellies, with each giraffe having a unique pattern of spots. They have long, prehensile tongues that are distinctly blue-black to protect from sunburn. Giraffes have long necks, which they use to browse the leaves of trees. They possess seven vertebrae in the neck (the usual number for a mammal). They also have slightly elongated forelegs, about 10% longer than their hind legs. Modifications to the giraffe's structure have evolved, particularly to the circulatory system. A giraffe's heart, which can weigh up to 10 kg (24 lb) and about 2 feet long, has to generate around double the normal blood pressure for an average large mammal in order to maintain blood flow to the brain against gravity. In the upper neck, a complex pressure-regulation system called the rete mirabile prevents excess blood flow to the brain when the giraffe lowers its head to drink. Conversely, the blood vessels in the lower legs are under great pressure (because of the weight of fluid pressing down on them). In other animals such pressure would force the blood out through the capillary walls; giraffes, however, have a very tight sheath of thick skin over their lower limbs which maintains high extravascular pressure in exactly the same way as a pilot's g-suit. Female giraffes associate in groups of a dozen or so members, occasionally including a few younger males. Males tend to live in "bachelor" herds, with older males often leading solitary lives. Reproduction is polygamous, with a few older males impregnating all the fertile females in a herd. Male giraffes determine female fertility by tasting the female's urine in order to detect estrus, in a multi-step process known as the flehmen response. 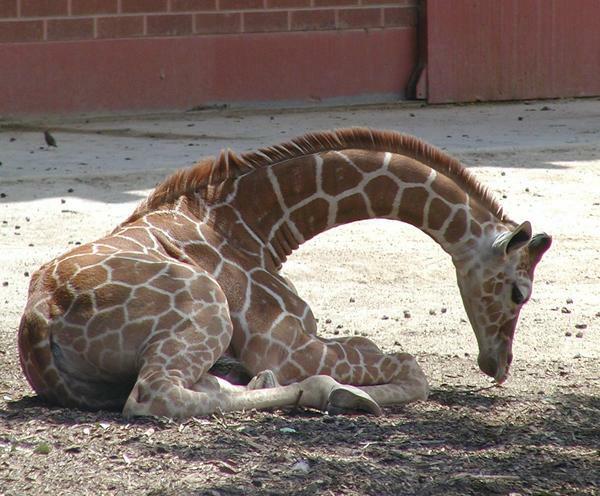 Giraffe gestation lasts between 14 and 15 months, after which a single calf is born. The mother gives birth standing up and the embryonic sack usually bursts when the baby falls to the ground. 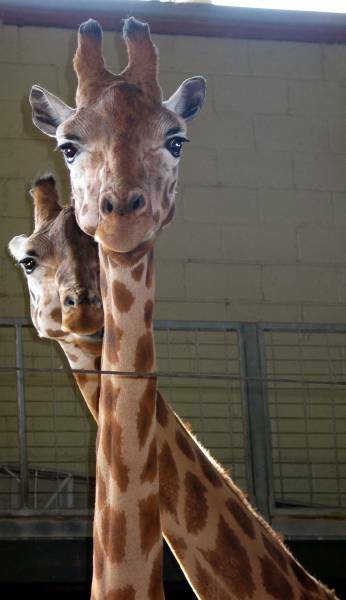 Newborn giraffes are about 1.8 metres tall. Within a few hours of being born, calves can run around and are indistinguishable from a week-old calf; however, for the first two weeks, they spend most of their time lying down, guarded by the mother. While adult giraffes are too large to be attacked by most predators, the young can fall prey to lions, leopards, hyenas, and African Wild Dogs. It has been speculated that their characteristic spotted pattern provides a certain degree of camouflage. Only 25 to 50% of giraffe calves reach adulthood; the life expectancy is between 20 and 25 years in the wild and 28 years in captivity. (Encyclopedia of Animals). * Reticulated or Somali Giraffe (G.c. reticulata) — large, polygonal liver-colored spots outlined by a network of bright white lines. The blocks may sometimes appear deep red and may also cover the legs. Range: northeastern Kenya, Ethiopia, Somalia. * Angolan or Smoky Giraffe (G.c. angolensis) — large spots and some notches around the edges, extending down the entire lower leg. Range: Angola, Zambia. * Kordofan Giraffe (G.c. antiquorum) — smaller, more irregular spots that cover the inner legs. Range: western and southwestern Sudan. * Masai or Kilimanjaro Giraffe (G.c. tippelskirchi) — jagged-edged, vine-leaf shaped spots of dark chocolate on a yellowish background. Range: central and southern Kenya, Tanzania. * Nubian Giraffe (G.c. camelopardalis) — large, four-sided spots of chestnut brown on an off-white background and no spots on inner sides of the legs or below the hocks. Range: eastern Sudan, northeast Congo. * Rothschild's or Baringo or Ugandan Giraffe (G.c. rothschildi) — deep brown, blotched or rectangular spots with poorly defined cream lines. Hocks may be spotted. Range: Uganda, north-central Kenya. * South African Giraffe (G.c. giraffa) — rounded or blotched spots, some with star-like extensions on a light tan background, running down to the hooves. Range: South Africa, Namibia, Botswana, Zimbabwe, Mozambique. * Thornicroft or Rhodesian Giraffe (G.c. thornicrofti) — star-shaped or leafy spots extend to the lower leg. Range: eastern Zambia. * West African or Nigerian Giraffe (G.c. peralta) — numerous pale, yellowish red spots. Range: Niger, Cameroon. 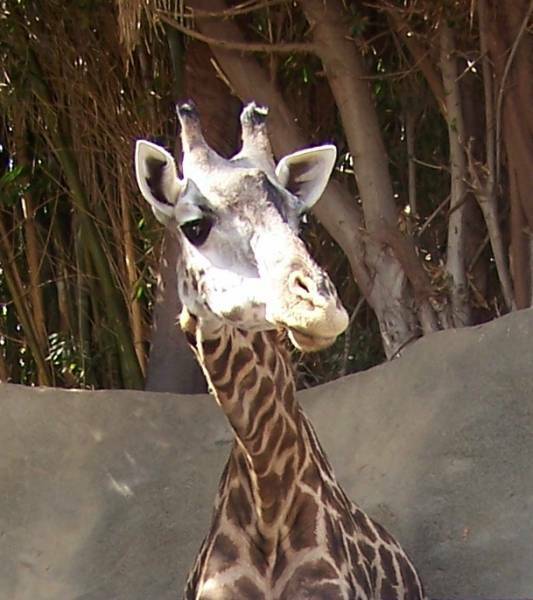 Some scientists regard Kordofan and West African Giraffes as a single subspecies; similarly with Nubian and Rothschild's Giraffes, and with Angolan and South African Giraffes. Further, some scientists regard all populations except the Masai Giraffes as a single subspecies. By contrast, scientists have proposed four other subspecies — Cape Giraffe (G.c. capensis), Lado Giraffe (G.c. cottoni), Congo Giraffe (G.c. congoensis), and Transvaal Giraffe (G.c. wardi) — but none of these is widely accepted.